What’s named after a horse, older than a horse and can keep you warm in winter? So-called because of their bristly appearance, the horsetails are an intriguing group of early plants that have existed since the Devonian period . Fossil evidence shows that they were a dominant part of the flora during the carboniferous period both in terms of species number and size . Along with other early plants such as ferns, the horsetails formed the forests that the dinosaurs inhabited. So what about keeping you warm in winter? Our coal deposits were formed from the vegetation that grew during the carboniferous period. Today the fauna are usually smaller and horsetails are smaller. However, the horsetails that grow today look very similar to the ones we see in the fossil record. This has led to some describing them as “living fossils”, a term first coined by Darwin in “on the origin of species” to describe organisms that appeared to remain unchanged over time as a result of not being exposed to selection pressures. Today it tends to be used to describe species that appear relatively unchanged from their ancestors in the fossil record. Horsetails are clearly recognisable from the fossil record, however it is inaccurate to say that they haven’t evolved at all in the past millions of years. Despite the controversies over this term it is still interesting to question why horsetails appear to have changed relatively little since the carboniferous period: They must have a body plan or growth strategy that works well and has allowed them to persist for so long. The phylogenetic grouping of the land plants has been subject to a large amount of change over time and no grouping has gone unchallenged. As new techniques and data become available scientists have changed their mind about how the early vascular plants, which include the ferns, horsetails and lycopsids are related to each other. Understanding how these groups of plants are related to one another is crucial to understanding two pivotal events in the evolution of land plants; the evolution of a vascular system and the evolution of seed-bearing plants. Historically, the ferns and horsetails were believed to be separate lineages. However, Pryer et al. (2001) found evidence to suggest that horsetails are nested within the ferns forming a monophyletic group now termed the Monilophytes . Determining the number of species that exist in the Equisetaceae and how they are related to each other has been difficult because members exhibit a large amount of morphological plasticity and hybridisation occurs frequently. These factors have led to overestimation in the past. Today it is generally agreed that there are 15 different species . The Equisetaceae comprise one remaining genus, Equisetum which is considered to have 2 sub-genera: Equisetum and Hippochaetum. Hippochaetum is distinguishable from Equisetum by its sunken stomata and stems that are generally unbranched. Equisetum have superficial stomata and branched stems . How do we identify Equisetum myriochaetum? Members of the horsetail family are easily recognised by their upright stems with a brush like appearance. All members of the horsetail clade have whorls of branches, a hollow stem, leaves that are reduced to a scale like sheath around the node and sporangia that are clustered into strobili (Kenrick & Crane, 2007) . Like all horsetails, Equisetum myriochaetum grows well in wet fertile areas and they are often found growing in tropical forests alongside streams and swamps. As well as being found in the Reading University tropical glasshouse, Equisetum myriochaetum grows natively in south and Central America between Mexico and Peru . 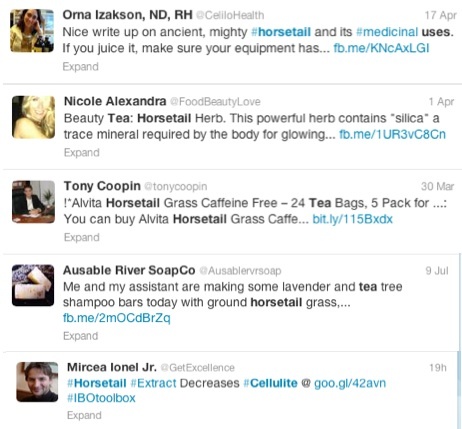 As a quick search of twitter shows Equisetum is currently being used in a huge variety of ways ranging from tea to cellulite and hair loss cures. The Romans used horsetails medicinally and several species of horsetail are still used as herbal remedies . Equisetum myriochaetum is sold in Mexico to treat kidney disease and type 2 diabetes . Commonly known as scouring rush the horsetails have been used by early pioneers in America as well as desperate campers today to clean pans. The high silicon content in their stems make them particularly good at scraping off dirt and polishing metal. All gardeners and allotment holders are familiar with horsetails and the problems of eradicating them from their land. Although E. myriochaetum has not been reported to be an invasive species several Equisetum species have been known to cause problems. All horsetails are deep-rhizomed and spread rapidly. They reproduce sexually by the production of spores but also asexually by rooting rhizomes or stem pieces. These shared characteristics are factors that explain why the horsetails can become invasive species. It also may explain why the horsetails have been so successful. Researchers in France have recently discovered that horsetail spores are able to “dance”. By carrying out detailed microscope observations they have observed that horsetail spores use “legs” to “walk” and “jump” about. Under the microscope you can see that each spore has 4 legs (or elaters) that curl and uncurl in response to changes in the atmospheric water content. The movements of the elaters allow the spores to “walk” allowing them to move out of the sporangium and to areas with different moisture contents. When the spores go from a very high humidity level to a dry environment the sudden change causes the spores to jump up to 1cm (which is 200 times the height of a spore). This relatively small jump is enough to allow spores on the ground to be caught by the wind enabling further dispersal . This “tiny dancer” is beautiful to watch. This mechanism of using several “jumps” to disperse is very different to strategies used by other spore bearing plants such as ferns. Could it be a characteristic that has allowed the horsetails to survive for so long and have such a wide range? All photos are by Alison Eyres and are licensed under a Creative Commons Attribution 3.0 Unported License. Many thanks to Hazel McGoff from the department of Archeology for the time she spent finding and explaining Equisetum fossils. Kenrick, P. and Crane, P.R (1997) The origin and early evolution of plants on land Nature 389: 33–39. Marmottant, A. Ponomarenko and D. Bienamé. The walk and jump of Equisetum spores. Proceedings of the Royal Society B. Posted online Sept. 11, 2013. Brownsey, P.J and Smith-Dodsworth, J.C. (1989) New Zealand Ferns and Allied Plants, David Bateman publishing. Budding botanist at the University of Reading. This entry was posted in Americas, Evolution, Mexico, Species, Students and tagged Archaeology, Equisetaceae, Equisetales, Equisetum, evolution, Fossils, Hippochaetum, Horsetails, Mexico, Monilophyte, Peru, scouring rush, twitter. Bookmark the permalink.